One small nugget in the Open Faculty Patchbook, nestled in among all the words in all the chapters. It’s one that I’ve lived by since beginning to teach and I found them inside a chapter that had a title that would not have revealed that this nugget lay deep within. Like mining for jade or gold – it’s a small piece wrapped around other valuable pieces. Here’s my nugget from Chuck Pearson’s Chapter Twenty-One: Just Listen. Chuck frames this nugget by first sharing his teaching philosophy. The single most important thing I do with a class each quarter I teach is to learn each student’s name, and call them by that name. 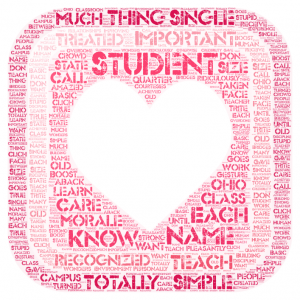 This is a ridiculously simple thing to do, but on a campus of Ohio State’s size, a student will be totally taken aback and pleasantly amazed by this simple gesture. People want to be recognized; they are turned off in an environment where they are treated like a face in the crowd, and receive a morale-boost when they are personally recognized and treated as if they are important. Basic courtesies like this work wonders in improving the morale of a classroom, and in building strong human relationships between the teacher and the students. 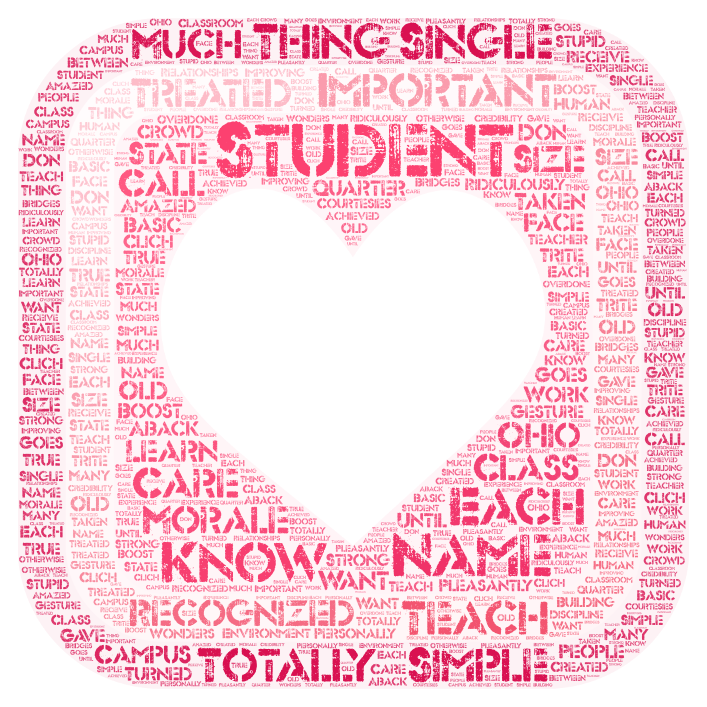 Here’s how this nugget, along with the teaching philosophy, looks when collected into a word cloud generator. In true Chuck Pearson spirit, the word STUDENT takes prominence, with KNOW and NAME alternatively positioned below the ending point of the heart shape, indicating the ‘point’ of this nugget. 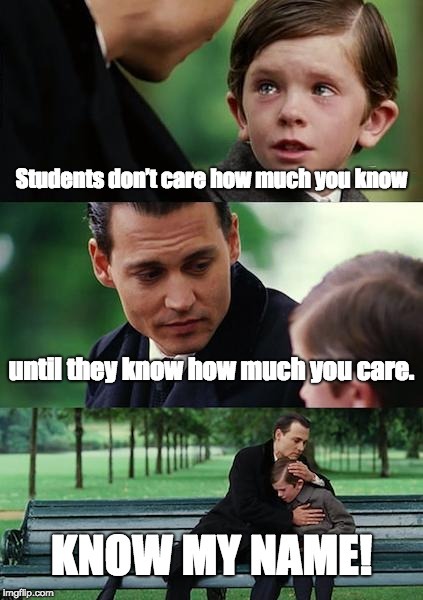 Each student is important, in every classroom, in every location, for every teacher. Knowing their names and being able to call each one by name is an important building block to human relationships in the classroom. Thanks Chuck Pearson for this nugget! It’s TOTALLY SIMPLE! The interactive version of this image can be found HERE. And a meme to make sure it’s remembered! A domain of one’s own – WIIFM?